My Dad grows quite a lot of his own veg, fruit (and chickens) and his Rocket is without doubt the greatest I have ever stuffed into my face. Rocket’s main characteristic is it’s pepper qualities, good rocket should take your head off :). This dish takes advatnage of that and marries it up with salty, sweet and creamy – it’s a cool little starter if you serve it like I have here or you can make lots of smaller rolls and serve them as ‘Ambassadors nibbles to be followed closely by the obligatory “Ferrari Rochers”. First sort out the anchovies, they usually come already oiled but I find adding garlic, lemon juice and flat leaf parsley really brings them up.Crumble some hard cheese and cut a doorstep of bread. Simple as that. 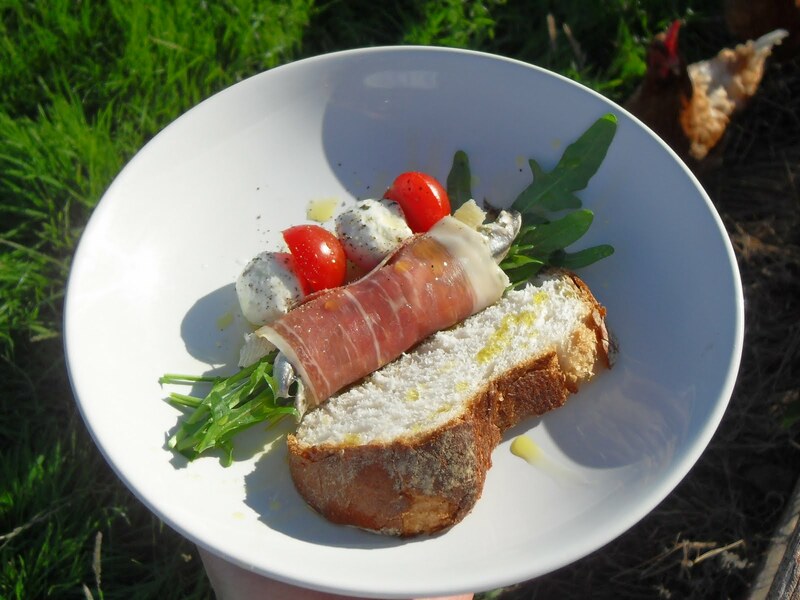 Serve with the goats cheese, tomatoes and bread and moisted everything with the oil. You can also saute off the tomatoes with a dash of red wine vinegar and some sugar it makes a magic sweet tomato ‘crush’. Salty, creamy, sweet and substantial as a summer starter.